Bramley's Seedling is without doubt the definitive English cooking apple, and in terms of flavor ranks as one of the world's great culinary apples. Although England has produced a large number of excellent "cookers", Bramley is so dominant that the others are largely forgotten. Most cooks reach automatically for the trusty Bramley, and it is equally prevalent in commercial apple bakery products in the UK. Its key feature is the very high level of acidity, and the excellent strong apple flavour it lends to any apple dish. In England a clear distinction is made between "eaters" and "cookers". English apple cookery usually calls for apples which cook to a puree - and the intense acidity of Bramley's Seedling guarantees the lightest and fluffiest of purees. This contrasts with the traditions of other countries, notably France and the USA, where cooks often prefer apples which keep their shape in cooking. For this reason Bramley's Seedling is not as well-known outside England as some of the other popular English apple varieties. It is quite widely planted in gardens in Denmark (where by 1938 it was considered to be the 4th most popular variety grown) and is now becoming popular in the USA as a result of increasing interest in English apple varieties. Bramley's Seedling trees are extremely vigorous - at least a size larger than most other apple varieties on any given rootstock. They are quite easy to grow, and have attractive crimson blossom. The only complication for gardeners is that Bramley's Seedling is a triploid variety, with three sets of genes instead of the more usual two. As a result it needs two different pollinating apple trees nearby to ensure successful pollination. They are also notably long-lived. 2009 was the 200th anniversary of the discovery of Bramley's Seedling, and - remarkably - the original tree was still alive in the same garden in Nottinghhamshire, England, where it was planted as a pip by a young girl, Mary Ann Brailsford, 200 years before. It takes its name from a subsequent owner of the house, a Mr Bramley who allowed a local nurseryman to propagate it in the 1850s on condition that it was given his name. 5 trees on Bud-9 one on m26. Vigorous! spury yet fat-wooded. Flat wide antler-like growing branches like Belle deBoskoop on bud-9. Regular, heavy bearing, even good in the shade-as it's thin acid is like a lemon-perfect complement to a pie (with another apple to add flavor). Yes, not much flavor, just acid. The "Northwest lemon". 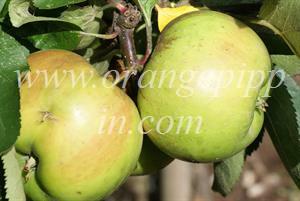 Hi, I have just bought a Bramley seedling and it has several apples on, some of which fell off when planting. Its a bit early in the season to be harvesting them but will the fallen ones continue to ripen?, can I use them now? what is best?? I have over the last few months planted the beginning of my home orchard. I started with a couple of gifted Katy's, 3 Red Devils purchased from this site (thanks!) and most recently a Bramley Seedling from my local garden centre. Since I'd grown up with a small orchard at home I couldn't consider not having one of my own at our new house. I've gone for all large root stock to give the summer shaded orchard feel. I'm currently researching pollination due to just having picked up a Golden Delicious tree for a fiver and just determining that it 'fits' with the rest before I plant it. Looking forward to my first starter crops this year! To the Aussies and Americans looking for Bramleys, I'd offer to send you some but I'm not sure they'd go the distance and wold cost a fortunte to ship. Has anyone actually made any homemade cider from them? We have one Bramley tree in our garden here in Dublin. It gives enough apples for the whole Winter most years. It's the only cooker I ever remember eating but this is probaby because others can't compete. Kimmy...... It is my understanding that "Bramley Original" should only be used to describe trees that are propagated from scion wood taken directly from the original tree, which still grows in Nottingham - England. There are claims that what is sold as Bramley by most nurseries is somewhat mutated, due to so many propagations in the last two centuries. It is claimed that grafts of Bramley Original produce slightly superior fruit and a slightly better-structured tree than what is usually sold as Bramley. I'm trying to find out the difference between a "Bramley's Original" and a "Bramley's Seedling". Some mail-order Web sites sell both varieties. There must be some physical or flavor differences or they wouldn't sell both varieties. Also, does anyone know of a source for both of these varieties in California? I'm not interested in dwarf or semi-dwarf rootstock. I want the tree to grow to full size - 30 ft tall or higher. M-111 rootstock might be okay, but nothing smaller than that. Nurseries outside of California usually will not ship to California, unfortunately, and most nurseries only have the smaller growing rootstock. I planted a bramley apple tree about 7-8yrs ago, can't remember exactly, and it has grown well and gives us the most delicious apples, much, much redder than ordinary bramleys. It is so sweet it needs no sugar when cooked and has a lovely fluffy tecture. Does anyone else have a red bramley? I've been trying in vain to find someone or somewhere selling BRAMLEY apples, Granny Smith's are a poor substitute for cooking apples. Is there anyone in NSW growing Bramleys? saw delia's recipe for mincemeat and it called for bramley apples....what is a good substitute for this here in the states...thanks!!! Have to disagree that the Bramley is unsuitable outside a large commercial orchard. My family home in the UK has a small orchard consisting of four small Bramleys that have been going strong since my grandparents planted them back in the fifties. Every year we get so many apples we have to give away vast quantities. But the rest store very well throughout winter in an apple rack. In my view, no English apple orchard, private or commercial, is complete without a Bramley, the best cooking apple, and a Cox Orange Pippin, the best desert apple, both symbolising the very quintessence of an English cottage garden. It may be different here in the UK, but my Bramley flowers at the beginning of the season, usually the second variety out of forty to come into blossom. Mine are huge vigorous trees, at least eighty years old, the branches are about twelve inches in diameter - when they go above thirty feet high we cut a couple of the highest branches out and they keep us in firewood for weeks. As the trunks are hollow it seems a good idea to take some of the weight off them. Ours are Crimson Bramleys, pretty red flushed fruit, many of them are very large, the size of two clenched fists. We get, at a guess, about ten wheelbarrows full of fruit from each tree, they've certainly repaid us well for the price my grandfather paid for them. 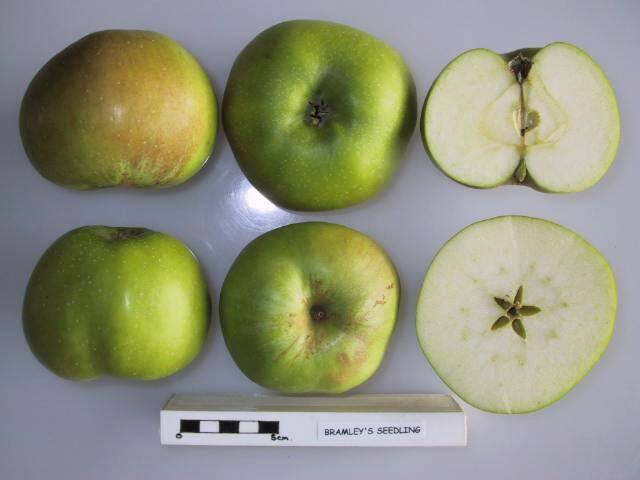 Bramley's being a triploid variety, it is sterile and requires another apple tree for pollination. Also, since Bramley's blooms very late, someone with room for only one other tree would do well to choose a self-fertile or partially self-fertile cultivar that blooms no earlier than mid-season in order to set Bramley fruit. A few possibilites that come to mind (no doubt there are more): John Grieve, Greensleeves, Kingston Black, Wolf River, Fiesta, Ellison's Orange, Northern Spy. Looking up the relatives of these cultivars may yield an option to suit your taste. Like Cox's, Bramley's is a poor variety for growing outside of large commercial orchards because of its awkward pollination requirements. It is supposedly far better on a large root-stock. Agreed on the comment about modern supermarket Bramley's - very unripe, though good flavour - fruit picked riper is a lot less tart. Bruno, If you are located in the States, look up Raintree Nursery via a search engine. They offer Bramley on semi-dwarf rootstock (EMLA 7) which their catalog indicates should grow to about eleven feet tall, and semi-standard (MM111) which I would guess may reach 17 feet. I have ordered five different fruit trees from this company (four apples: Liberty, Queen Cox, Kingston Black and Ashmead's Kernel; and one sour cherry: English Morello) and my trees are doing well. I hope for a first crop this season. I don't really feel Bramley is "extremely tart". Very unripe ones (usually quite dark green) often found in supermarkets can be sharp. If allowed to ripen they can be eaten raw (I always steal a slice or two when cooking them) and need only a little sugar when cooked. Try adding sultanas or raisins to get the sweetness. This is a lovely apple. Unfortunately I have never seen them anywhere except Ireland and the UK. Do you know where I may be able to buy Bramley apples?? The Bramley is the definitive cooking apple. Vastly superior to all others when used in tarts and pies. Because of the extreme tartness it requires large quantities of sugar giving a moist well flavoured result.